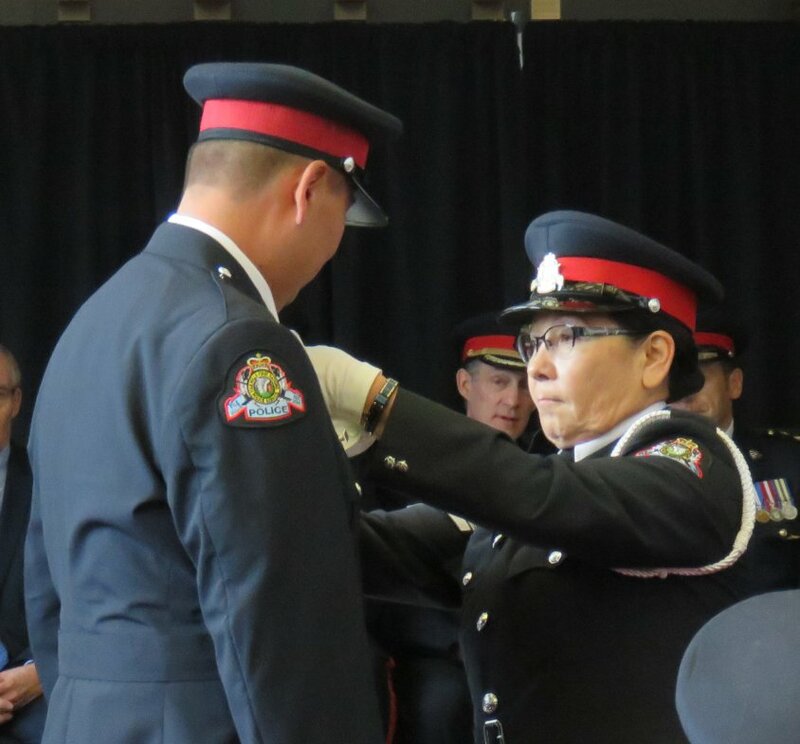 In a first for the Saskatchewan Police College, new File Hills First Nations Police Service Constable Justin Thomson received his badge from his mother during a police graduation ceremony on Dec. 15. Recruit Class #75, a group of 20 cadets from Saskatchewan and Manitoba, became sworn police officers in a formal badge presentation ceremony at the Conexus Arts Centre in Regina after about six months of intense training. While it is not uncommon for a new police officer to receive their badge from their father, who is or was a serving police officer, the Dec. 15 ceremony was a milestone for the province because it was the first time in Saskatchewan that a new police officer’s badge was pinned to his tunic by his mother. Corporal Carol Thomson has been a serving member of the File Hills police service for four years, and before that served as a member of the RCMP for 25 years. “It was a touching and emotional moment for everyone there,” said File Hills Chief of Police Len Busch. “Once the badge was pinned on there was a slight break from protocol as a very proud mother couldn’t resist giving her son a hug, which was loudly applauded by everyone in attendance. What a great start to what we know will prove be a very promising career for Constable Thomson.